ST. LOUIS (AP) — David Perron likes his new line. Perron’s second goal early in the second made it 4-1. Smith misplayed the puck behind the net, allowing Schenn to steal it and find Perron alone in front with an empty net. 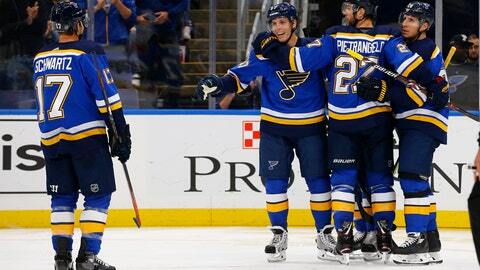 Perron, playing in his third stint with the Blues, completed the hat trick with 35 seconds left in the second. His last hat trick also came at Calgary’s expense on Oct. 22, 2016. “I put pressure on myself to score every night and it’s nice to get my first one in a Flames jersey,” Neal said. Allen got help from his post on Sean Monahan’s penalty shot late in the first period. He also made several tough saves as the Blues killed off a 5-on-3 for 1:35 late in the second period. NOTES: David Rittich stopped eight shots in relief of Smith. … Blues rookie centers Jordan Kyrou and Robert Thomas each earned their first career points with assists. … Flames C Dillon Dube (lower body) had an assist, despite missing practice on Wednesday. … The Blues scratched RW Chris Thorburn, D Vince Dunn and D Jordan Schmaltz. … The Flames scratched D Dalton Prout, RW Garnet Hathaway and C Mark Jankowski.